‘Bloody awful, all of it,’ she tells us straight off. The deals the company is working on pump up or destroy businesses, employ or lay off hundreds of thousands of people. She knows this, and she knows they have the power to sink Third World economies. Half-understood, seemingly arbitrary actions may cause untold human suffering. She has no illusions about changing the system – she isn’t in any position to do so – but she disapproves of bankers on principle, just as her bosses disapprove of the literary flourishes she injects into the speeches she writes for them. Until now Cath’s leftist humanitarian politics have been ‘not so much unexamined as untested’. She soon realises that her superiors are the true idealists: their religion is free-market capitalism, their gods Ronald Reagan and Margaret Thatcher, their gospel the Op-Ed page of the Wall Street Journal. They are arch Clinton-haters (the book begins in 1993), and despise affirmative action, feminism, the disabled and everything else Cath’s moral conscience would like to stand up for. And she doesn’t like the young female investment bankers either: they had ‘perfected – indeed, made into an art form – the kind of hand gestures that blinded you with their large diamond rings’. This wasn’t what her generation fought for. Cath strikes up an office friendship with Mike, a mathematician and risk manager, whose job is to advise the top brass of potential disasters. Another former 1960s rebel, he now considers himself a free radical, ‘spreading his criticisms scattershot’, and he shows her some of the ropes. Cath works very close to the centres of power, but regrets being a cog in the capitalist machine and wielding almost no power herself. She is amazed by the risks being taken, and how open people are about them. Mike tells her that derivatives are ‘freakish’ – straightforward gambling contracts. The Leonard Cohen song ‘Everybody Knows’ is his theme tune: everybody knows that what they’re doing is sleazy, risky and untenable; everybody knows that someday it’s going to implode. Getting the world of work right in fiction is difficult. Get bogged down in mundane details and you risk boring the reader. Fail to give it the weight it deserves and you lose credibility. It deserves a lot of weight. Work is the driving force of American life: finding it, getting to it, dressing for and recovering from it take up most of the hours in a day. You get two paid weeks off a year and six to have a baby. If you’re lucky work funds medical care and childcare and pensions and life insurance and even higher education. Because the Government provides almost none of this, it’s a disaster to lose your job. People see more of their colleagues than they do of their spouses, and develop bizarre, work-based approximations of these relationships – they may acquire office husbands or wives they don’t even sleep with. Get work wrong and you get the whole story wrong. Yet very few novels even try to get it right. Their tales of self-realisation and emotional enlightenment take place in a vacuum. Few writers are sensitive to the way in which the world of work affects the individual; nor do they even appear to realise that it is often the principal sphere in which character is played out. Novelists are more likely to breathe the rarefied air of academia, journalism and publishing, and set their stories there. None of these worlds bears much resemblance to the places where most readers work. These writers may have the time and space necessary to produce good novels, but few have the inside knowledge to represent other work cultures convincingly. Setting a novel in the financial world presents particular challenges, especially when the business is central to the theme. Most people are afraid of numbers, while those who aren’t – those who work with them – may be just plain sick of them. Tom Wolfe’s Bonfire of the Vanities and Michael Lewis’s bond-trading memoir, Liar’s Poker, in common with the many chronicles that imitated them, keep their focus tightly trained on the upper echelons, as if they were all that mattered. But the financial world has always been more than the playground of the Big Swinging Dicks, and the dot.com billionaires who followed them. Wall Street is also the fail-safe local industry in New York, one of the few sectors hiring in the midst of recession – partly because it also fires so freely – and one of the few places where, like Cath, you can go from no money to a lot of money without, technically, doing anything illegal. Uninterested in wealth and status, Cath is fascinated by her bosses’ motivation, which has less to do with greed than religious zeal. She’s never in danger of being seduced by their materialism, but she is afraid of being seduced by the hype; she feels herself starting to believe the propaganda she writes. Jennings avoids the pitfalls by splitting her terrain: the stories of a free market spinning out of control and the twilight of Cath’s husband’s life run side by side, barely touching for most of the book. Scenes with the afflicted husband, Bailey, are separated from the office narrative, reflecting the absolute division between work and private life. In the chapters dealing with Alzheimer’s, Jennings uses a more heightened language: her husband ‘would erode like a sandstone statue’, leaving her to a ‘blistering loneliness’. She spares us the bedpans and temper tantrums; and, a careful judge of how much we can take of each story, she shifts from one to the other. The banking story is boiled down for easy consumption, conducted in explanatory conversations between Cath and Mike. ‘Moral hazard’ is invoked when governing monetary bodies decide to rescue mismanaged financial companies for the good of the system as a whole. ‘Where’s the incentive not to screw up?’ Mike asks. The book is rich with financial terminology that readily lends itself to metaphor. Mike tells Cath that they are both ‘Snoopy blankets’ – there to keep analysts and investors happy. Her husband’s Alzheimer’s, Cath concludes, is an ‘outlier’ – an unexpected event on the tail-end of a probability curve. Similarly, after ten years of strong performance, Cath’s marriage, like a stock share mutual fund, will lose its entire account value. A doctor tells her: ‘You will have to say goodbye to the man you love.’ Cath is stoical, almost to a fault, in her devotion, in the nights she spends at Bailey’s side. In the nursing home no less than the investment bank, we witness the unfairness of a society that doesn’t take care of its citizens when they are ill, and the financial catastrophe that follows. (If nothing else, the novel should spur sales of long-term care insurance.) Cath compares corporations to Nazi-occupied France, where everybody turned a blind eye. In the end she can find no more meaning in corporate life than she can in Alzheimer’s. Her husband’s decline is heartbreaking, but it can also be funny. ‘An advertisement for myself,’ Bailey notes with satisfaction of his name plate in the staggeringly expensive nursing home she has found for him. ‘A baby elephant lives there,’ he says as a squeaking linen trolley trundles past. At the same time, Mike starts to become unhinged. He contemplates not warning the CEO about an imminent hedge fund blow-up, an event which could threaten all the Western markets – the Pacific rim is already floundering and Russia is about to default on its loans. Enthralled by the prospect of mass chaos, he longs to call the bosses on their extremist belief that markets are efficient, and that disasters teach a lesson. The workplace and domestic dramas run parallel to each other. The doctors who refuse euthanasia, but look the other way should you choose to put your loved one out of his misery, echo the executives who let markets run amok: when they see profits, they don’t ask questions. By the story’s end, Cath’s ambiguous morality is tested in both spheres. Some years ago Tom Wolfe took the American literary establishment to task for failing to document the great issues of the day, pointing to the naturalism of Dickens and Zola, as well as Bonfire of the Vanities, as examples of what novelists should be doing. Yet something doesn’t ring true when an author/journalist gathers research instead of writing out of direct experience. Wolfe sometimes piles up too many facts, dwelling distractingly on the lifestyles of the rich at the expense of their inner life. Jonathan Franzen does something similar in The Corrections, where the thoughts of an investment banker are rendered in the voice of a disaffected New York fiction writer. Jennings, on the other hand, actually worked as a speechwriter for two large downtown investment banks; she turns her experience into fiction that feels like life. She is the author of seven previous books, only one of them a novel. There has been a strong autobiographical streak: the central figure in her 1990 collection of poems, essays and stories, Women Falling Down in the Street, is an Australian emigrant in New York, a former feminist radical married to a much older man, looking back on an isolated outback childhood and a foolhardy young adulthood, now middle-aged and finally trying to make sense of things. Snake, her previous novel, portrayed an outback farming family experiencing the outer world, after World War Two, by proxy. The novel was starkly poetic, a writer’s writer’s book that was the last to be dropped from the Booker Prize shortlist. Being so spare, it left stronger visual impressions than emotional ones. It was a novel of the personal, the everyday, perfectly well told in its semi-poetic form – some of the chapters were only half a page long. 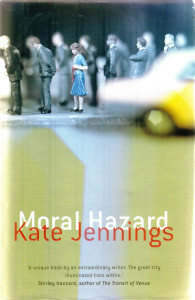 But as with so many other novels of the kind, one sensed that Jennings was working up a style around limiting material. In this respect, Moral Hazard is a breakthrough, a more full-blooded portrait. Early in the story, Cath telegraphs her values to the reader through her favourite writers, who include Muriel Spark, Sylvia Townsend-Warner and Ivy Compton-Burnett: ‘they assumed intelligence – emotional as well as intellectual – on the part of the reader.’ Jennings’s style shares these writers’ brevity, directness and authority, but conveys more warmth, more innocence. Working in the belly of the beast has served her writing well. The culture of free-market extremism explored in Moral Hazard played its part in making possible the attacks of 11 September. Globalisation boosted bad will; deregulation of the airlines created a hijacker-friendly environment in the skies. Big banks like the one where Cath works quickly had to cover up the extent to which they managed the money of people now identified with terrorism. There is a large discrepancy between the US Government’s habit of turning a blind eye to what it doesn’t want to see, and its criticism of foreign governments for not taking responsibility for their own terrorist factions.